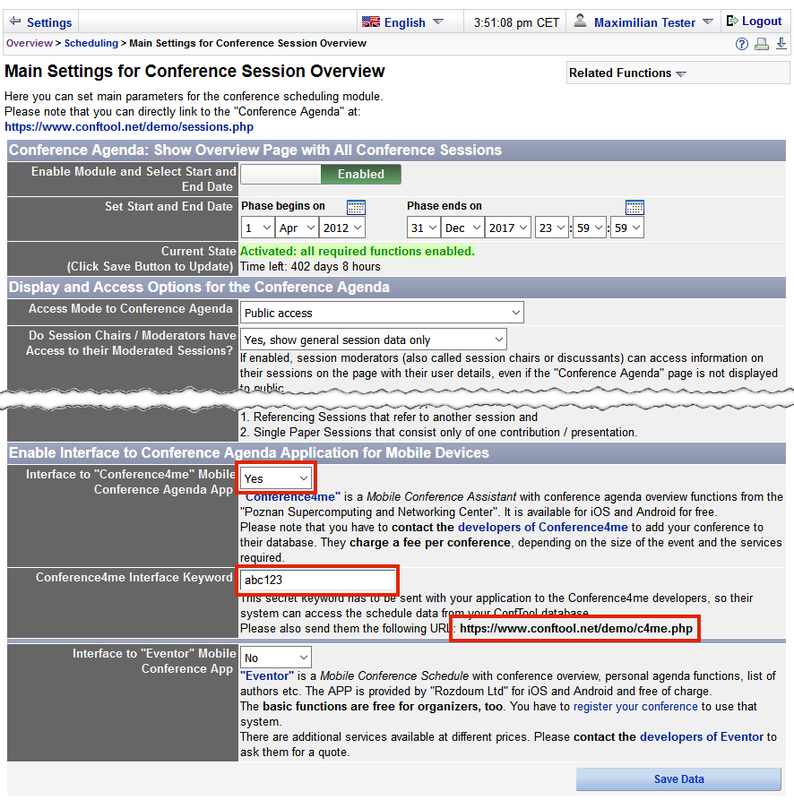 In ConfTool go to Overview => Scheduling => Main Settings for Conference Session Overview to enable the interface for the Conference4me servers (see Image 1). 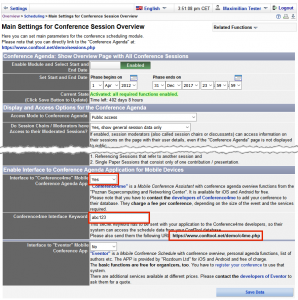 The ‘Access URL’ (which will look similar to this sample “https://www.conftool.net/yourconference/c4me.php”). Please send us both. These data will allow Conference4me to obtain the session information and the list of presenting authors in ConfTool Pro. More details about an integration with ConfTool you can find here. Just give us the url with public id of your conference and … that is all! The conference must be enabled publicly. Public id is indicated by bold font. HOW TO USE INDICO TUTORIAL may be found here. Export a XML program file and send it to us. We import the conference schedule (sessions, presentations, etc.) from the XML file generated by EDAS. Please do not modify the file manually! Every event id must exist and be unique. Sessioncode, title, date, time cannot be empty! We import the conference schedule (sessions, presentations, etc.) from the XML file generated by ePapers. Please do not modify the file manually! We import the conference schedule (sessions, presentations, etc.) from the XML file generated by Paperplaza. Please do not modify the file manually!